The potential withdrawal of the Scottish Government's support for anything associated with Sir John A. Macdonald has drawn the attention of the media in Britain to the kilt skate phenomenon. The Scottish Society of Ottawa has been in discussions with the Scottish Government on the future of the event. On Tuesday, August 21, Mhairi Stuart of the BBC Scotland drive home show "Newsdrive" interviewed the originator of the kilt skate and the former organizer of the national event, Don Cummer, on the issue. Stuart: There's a growing debate about whether we should honour major historical figures whose image has been tarnished by their mistreatment of Indigenous peoples in countries which were part of the British Empire. The Scottish-born founder of the Canadian nation, Sir John A. Macdonald, is at the centre of the debate over his legacy. 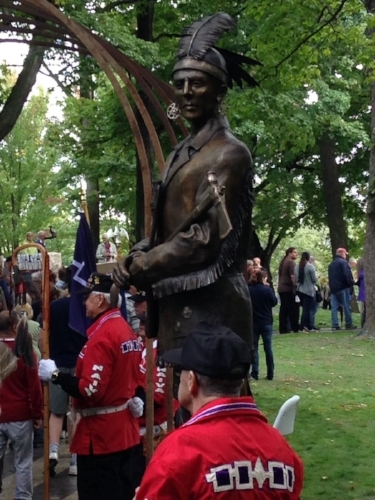 Campaigners want his statues removed from public places because of legislation he introduced which led to 100,000 Indigenous children being removed from their parents to assimilate them into Canadian society. The Scottish Government has confirmed it's put on hold funding towards an annual celebration of Macdonald's life by Scots Canadians because of concerns about his legacy. Don Cummer is the former national organizer of the kilt skate, an organization that celebrates Scottish heritage and which organizes the annual Great Canadian Kilt Skate celebrations. Cummer: It's an interesting story because I think that Canadians and Scots have a right to be very proud of Sir John A. Macdonald. He was one of the great nation-builders of the 19th century. He's up there along with Disraeli and Gladstone, and Lincoln and Bismark and Cavour -- a phenomenal achievement building that country at that time. Look what it's become today! Stuart: It's a difficult one, isn't it: particularly when you've got people wanting things like statues removed. It's like erasing him from memory. Cummer: Yeah, and when I turn and look at what South Africa was able to achieve with its Truth and Reconciliation Commission -- and it was all done with a spirit of forgiveness and understanding. And most of all, you listen to one another. And I think when you're saying, "Well, lets tear down statues, let's rename schools" that makes people close their ears and close their minds. And that's the last thing we need right now. 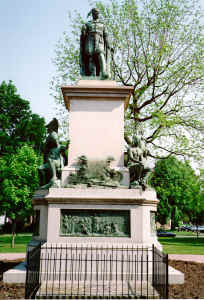 Instead of taking down statues of Sir John A., we need to be putting up statues to Crowfoot, and Tecumseh and Joseph Brant, and the great First Nation leaders that helped build our country. Stuart: How do you, though, make someone's legacy acceptable when there are elements of it that are... He obviously did a lot of good but he also did things that are considered bad. Cummer: Yeah, and he was very much a man of his day -- a man of his time. I think if we start judging the past by today's lenses there's going to be very few people who will ever have a statue made for them. We're all human and there's things we do wrong. Let's remember that Sir John A... he tried to give Indians the vote -- First Nations the vote. Many of his good friends in Ottawa were First Nations. He thought that the way to bring Aboriginal peoples into modern times -- what were modern times for him -- was to give them an education. Otherwise, he thought they would fade away. Now, some people call this "cultural genocide." At the time, it was not regarded as that. It was: "how are we going to make sure that these people survive?" Basically, the solution was to give them what was regarded at the time the best model of education that they had, which was the British public school system. You take kids away and you put them in the classroom with other children and you keep them away from their parents. Now, what that led to -- in terms of the residential schools -- was terrible. There were terrible things that happened. But it was not intended to be the evil that it became in many cases. Stuart: What would you say now then to the Scottish Government who have put their funding of the annual celebration of his life on hold? Cummer: Well, I'm a former organizer of Sir John A's Great Canadian Kilt Skate. And we celebrate Scotland's contribution to Canada by putting on our skates and going out in 40-below weather in our kilts. And the Scottish Government has been most helpful in their support for that. Now, on the one hand you can hear that I'm a passionate Canadian and I love my history and I'll defend my heroes. But I'm a public relations guy as well and I know you want to minimize risk when you're involved in public relations. So I can see why they'd be nervous about this. But I hope they don't go too far because we don't want to create this legacy of shame. Because Sir John A. 's achievements are something we can be proud of, both in Scotland and in Canada.